Today's bombings in London have reminded all of us, sadly, how unstable and scary the world can be these days. John and I are both just fine. Both of us were in areas bombed...me about an hour before, and John just after. Our timing was just very lucky this morning. And we've actually gotten back to John's house in Hertfordshire before dark, something we didn't expect given the state of mass transit in the London area right now. As of this evening, we're hearing that 37 people died in London today, and at least 700 more were injured. Here's a link to the BBC's latest report. I don't know what else to write...except I can post the following photo taken with the camera on my mobile phone late this afternoon. 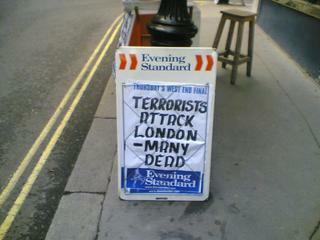 I took this at a newspaper seller's stand near where I was teaching in London today. Glad you and John are both safe. Glad to hear you're okay. Take care and be safe.